Hello and welcome back to DRU's Inspirational Blog! 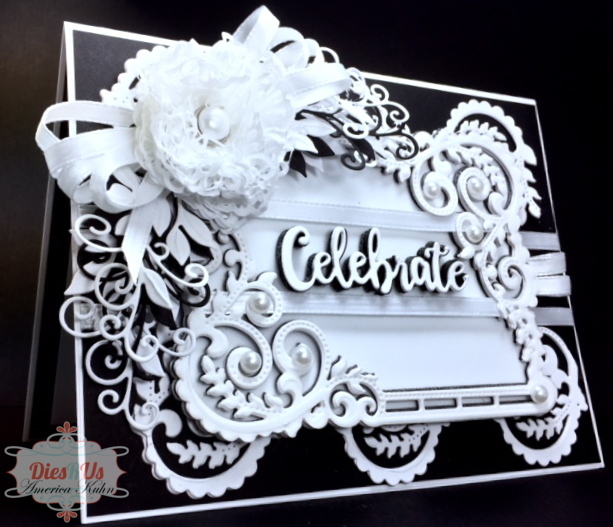 America is back to share a card created with Sue Wilson's gorgeous dies in different ways. 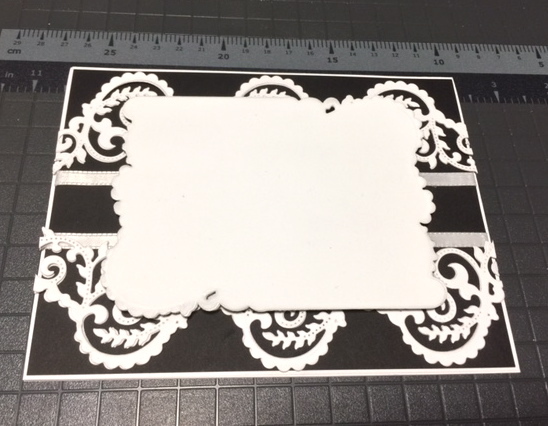 This card uses the Sue Wilson Isobel Die as a frame as well as borders. 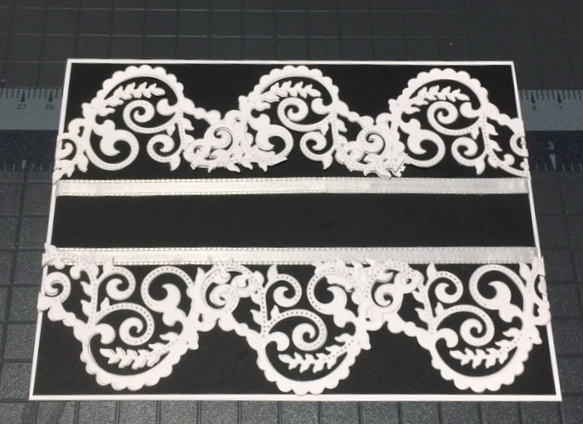 The flower was created using the Chantilly Lace Edger and accented with Petite Vinery diecuts, Ribbon and a Pearl brad and random ahesive white pearls. 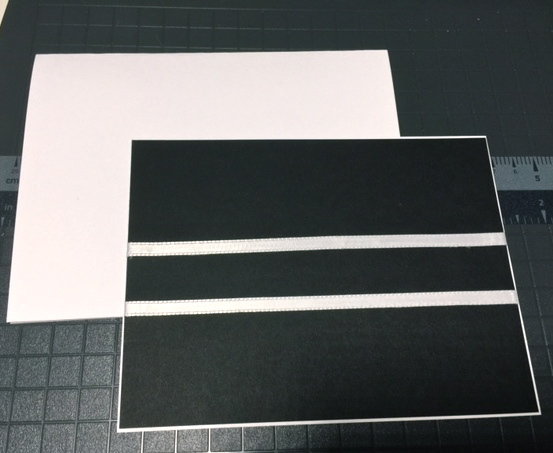 Cut your card base in white and another panel in black backed by white. Then adhere ribbon to this combo as shown. 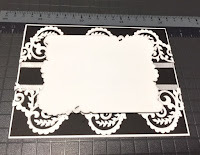 Next, cut out your Isobel die frame a total of 6 times, and snip at corners as shown here, These corners are then placed side-by-side, slightly over-lapping for this border look. 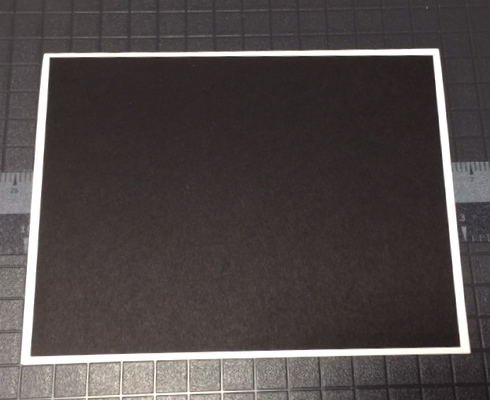 Cut the back frame of the Isobel in black, white and vellum. 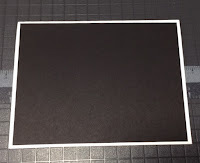 You are basically layering the framed panels under the sentiment for dimension, starting with black, then the white layer over the black then 2 vellum panels over the white to soften the look. This look will also match your Vellum Chantilly Flower. Back the panel with foam adhesive for dimension. 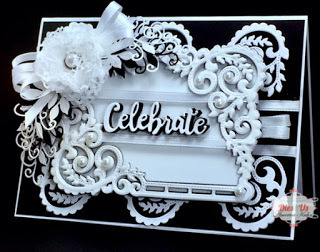 Next, die-cut several of the "Celebrate" word dies in black and one in white cardstock. 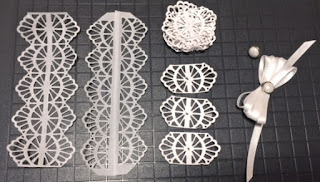 These cuts are then layered and spray- adhered together and placed in center of frame in between the satin ribbon lines. 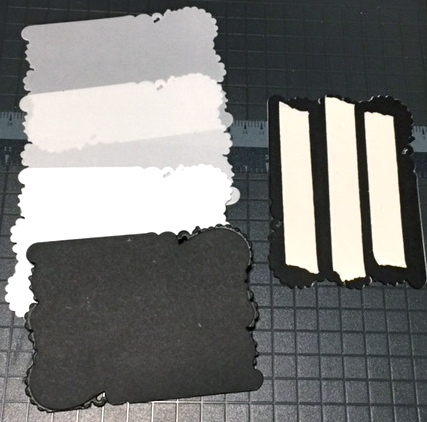 Also cut out several vines in white black and vellum to accent your flower. Then cut the Isobel Die 3 more times to layer on top of this framed panel. Now add more ribbon to top frame. Be sure to snip-off the end parts of your cut Isobel borders to clean-up the look. 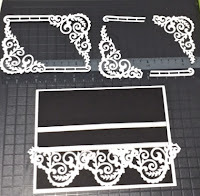 Adhere the die-cut vines to corner of top Isobel frame. Add a ribbon bow. Adhere tyour vellum flower directly over the spread. 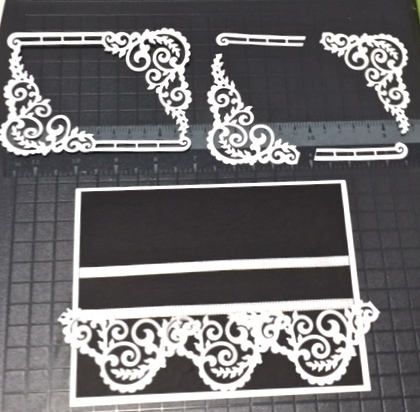 Add pearls and extra ribbon parts to opposite side of frame. 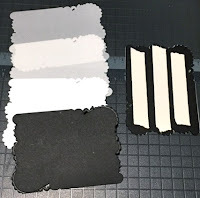 Because I love to layer my die-cuts for adding depth, here is a great thrifty tip to help you save on cardstock costs; I buy Kodak photo paper to use as my backings. It's heavyweight, so this makes your cuts sturdy. 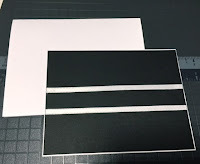 I then use spray adhesive to adhere to my cuts from designer cardstock. The best quality Kodak Photo paper stacks (Glossy or Matte) are always at Goodwills. Give it a try. These papers are also great or Mixed Media projects. We hope to have inspired you today and that you'll give these great cutting dies a try! This is beautiful America!! Love the black & white theme ... so elegant! Awesome tip too ... thanks for inspiration! Whoa, this is so stunning. I love how you have layered those elements for the great dimension. PERFECTION!!! !